The Director-General of the United Nations Industrial Development Organization (UNIDO), LI Yong and the Minister of Trade and Industry, Alan Kyerematen have signed the Country Programme (CP) for Ghana which will boost industrial development, trade and export competitiveness. The Country Programme, scheduled to be implemented from 2019-2022, will constitute the reference framework for UNIDO technical cooperation activities with Ghana. The CP is aligned with the national development agenda, including the President's “Ghana Beyond Aid” agenda, Ghana Vision 2020, and focuses on high growth potential sectors to achieve the Sustainable Development Goals (SDGs). Furthermore, the CP will help build synergies and help Ghana leverage additional investment by facilitating the mobilization of partners and resources to achieve larger development impact. 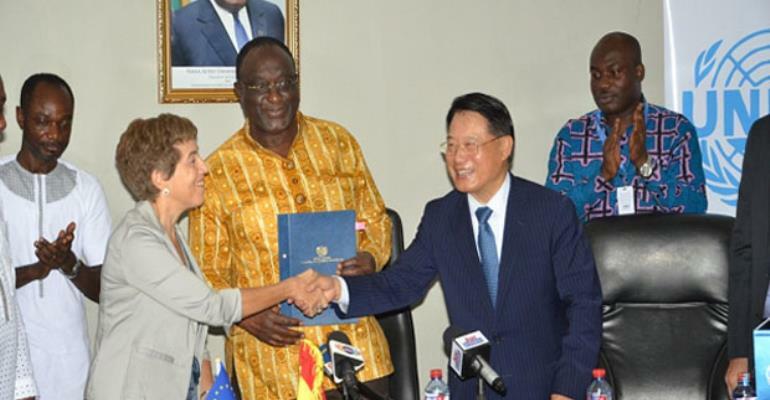 Furthermore, LI Yong, Mr. Kyerematen and the EU Ambassador to Ghana, Diana Acconcia, signed a cooperation agreement to strengthen the export competitiveness of the Ghanaian economy through enhanced value-added, low carbon, sustainable production and processing. The agreement will build on recent EU support towards competitiveness-related issues and will capitalize on lessons learnt, as well as complement ongoing interventions in Ghana. The agreement is to be implemented under the West Africa Competitiveness Programme (WACP) that aims to improve the performance and growth of selected value chains, including cassava, fruits (mango and pineapple) and cosmetics, as well as personal care products. These sectors are in line with the priorities of the Ghanaian Government and have a high potential for industrialization and job creation. The four-year programme will help develop value chains, improve the competitiveness of MSMEs, strengthen the supporting intermediate organisations, create better linkages among the selected value chain actors and increase access to regional and international markets.